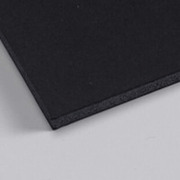 Black matte paper surface on both sides and black core middle.The foamcore has a built-in memory, allowing it to return to its original thickness after cutting. Made to exacting standards, our foam board is a resilient, polystyrene foamcore board "sandwiched" between paper liners. 35 points will be rewarded when you are logged in to your account and buy this item.